Camp Noah is a nationally acclaimed preparedness and resiliency program for children, hosted across the U.S. in communities that have been impacted by disaster and trauma. 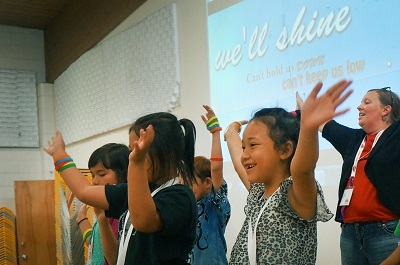 Camp Noah brings hope and healing to communities that have been impacted by disaster. Our vision is to serve disaster-impacted children and families by building resiliency, restoring hope and changing lives. Camp Noah is owned by Lutheran Social Service of Minnesota and operates nationwide. It began in 1997 as a response to flooding in the Red River Valley of North Dakota and Minnesota. In 2006, Camp Noah grew dramatically in response to Hurricane Katrina. Camp Noah has developed into a nationally recognized program for children whose communities have been impacted by natural disasters and other collective trauma. To date, Camp Noah has been hosted in 29 states and Puerto Rico in response to a wide range of natural and human-caused disasters. Since 1997, we have held 273 camps with more than 4,000 adult volunteers and have served nearly 14,000 elementary-age children. Camp Noah has a small but dedicated staff based in Saint Paul, Minnesota. For more than two decades, Camp Noah has responded to a wide range of natural and human-caused disasters. We identify camp locations each year based both on need and community requests. Each camp takes place over five days, but its impact lasts a lifetime. Because a child’s brain develops at such a rapid rate, it is uniquely sensitive to the disruptive forces of stress and trauma. We provide a safe and caring environment where children impacted by disaster or trauma build resiliency skills with peers within the familiarity of their own communities. Using a proven curriculum, Camp Noah helps children process their disaster or trauma experience through carefully designed activities and play. Camp Noah celebrates every child as special. In this transformative setting, children are encouraged to face their fears, grieve their losses, identify and share their unique gifts and talents, and plan for an amazing future. Why Should Children Attend Camp Noah? Disaster changes lives — especially for children. Whatever type of disaster or trauma they have experienced, children often need support to process what happened. A study published by the American Academy of Pediatrics titled “The Psychosocial Implications of Disaster or Terrorism on Children” states, "If children are helped to learn to cope with this stress, their symptoms subside. We can help our children live with this fear, adjust to it, and plan for the future rather than remain paralyzed in fear” (2005). 98 percent of campers surveyed in 2016 – include updated stats if available learned two or more resiliency skills during Camp Noah and said they had fun! 100 percent of parents surveyed in 2016 said they would recommend Camp Noah to other parents. Another parent said, "Each day my son learned something new and was very interested and excited about sharing his day. He is now not afraid when a storm comes. He shares with me how to stay calm." During Camp Noah, a team of Certified Camp Staff accompanies campers through an intentional curriculum that enables children to process their disaster and/or trauma experiences. This offers campers the space and time necessary to tell their stories and build resiliency skills. Campers participate in small groups, large group time (which includes music, skits and puppet shows), crafts and recreation time. Learn more about Camp Noah’s story and impact. Questions? Please call us at 1.800.987.0061 or send us a message.